The SATO M-10e, 10.5" printer (direct & thermal transfer), has been designed for big label printing, making it perfect for industries such as chemical drums, timber, automotive, etc. With a fast RISC processor, it results in the highest quality print at an amazing speed of up to 125mm per second!In addition, the M-10e also comes with many optional accessories such as real time clock, un-winder, cutter, dispenser and memory expansion so that you are able to select what best match your needs. 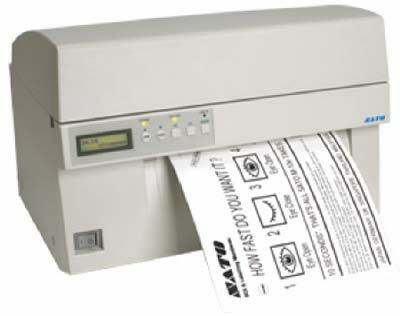 Label loading is also made easy with the auto label loading function: just install the label edge into the printer and the label is "fed" via sensor detector.This remarkable 10.5" printer also allows you to print rows of labels as it is able to print horizontally based on the A3 label size. For instance, if you are currently using a 4" printer, the M10e is able to print 2 labels of 4" wide label at the same time enabling you to save much time and money.